I am back with Tuesdays with Dorie (TWD) and will be back to posting weekly with the group from now until the end of the year. Even though we're down to the last few recipes in the book, we've got a lot of great recipes lined up. Believe it or not, we'll be done baking through the entire book by the end of the year! Isn't that crazy?! 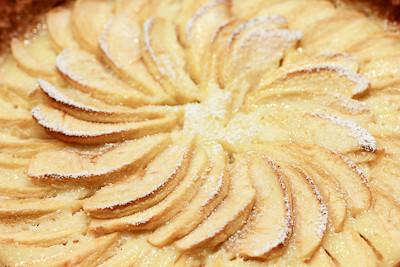 This week's TWD recipe was chosen by Jessica of Cookbook Habit: Alsatian Apple Tart. It is a tart lined with "thick slices of sweet apples and a vanilla-flavored mix of eggs, cream and sugar that is poured over the apples and, under heat, transformed into a soft custard." When I think of custard filled tarts, I think of fruit tarts that are topped with fruits like strawberries, blackberries, kiwi, blueberries, etc. I have never had a custard fruit tart with apples! Interestingly enough, the rich and creamy custard that envelopes the apples is absolutely delicious. I think the tart would be great with pears, too, which Dorie suggests in the "Playing Around" section. Thanks, Jessica, for hosting this week! I love baked apple desserts and this one was no exception. - Make sure to put a pie crust shield (or some foil) around the edge of your tart about 20 minutes into baking to avoid burning the edges. Oh wow, that is one stunning tart! I didn't have time to make this one, but I'm bookmarking it for another day for sure. Your tart looks scrumptious! It's really remarkable how we have some of the best recipes in the book here at the end of the group - what a testimony to the quality of Dorie's recipes. It's lovely! My edges got too dark also.... I hate that!